The Vertagear Racing Series P-Line PL6000 gaming chair is designed for comfort and equipped with superior ergonomic features. 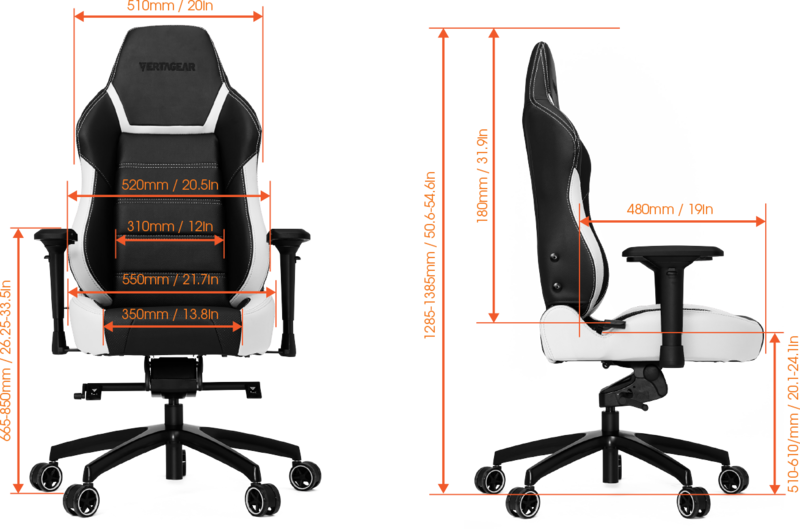 The industrial strength, extra padded gaming chair provides greater support and durability for your entire frame and head. The Plus Line (PL) is the perfect fit for users desiring more space. Assembled with a wide range of adjustability that enhances gamers' personal comfort, relax for extended periods during your intense gaming sessions. Recommended height: 175 cm – 211 cm. Elegant, Durable Exterior Made from premium quality PVC leather with stain resistant characteristics, the PL6000 has an extra dense foam padding that adds great support and comfort. The breathable open-cell structure limits heat being trapped. Ultra Premium High Resiliency Foam Our interior foam boasts a density that puts it well above the standard High Resiliency foam. Where High Resiliency foam sits at approximately 2.5lbs per cubic foot, our foam stands up to 4lbs per cubic foot, inching it near the realm of memory foam. The elasticity of the foam helps prolong the comfort life of the chair and adds to the overall durability of the product. Heavy Duty Metal Base Frame The PL6000’s heavy duty base frame is constructed with industrial strength metal to support up to 200 kg / 440 lbs of weight, for long lasting comfort. Large Soft Glide Casters The PL6000 comes with 75mm/3” PENTA RS1 casters that are engineered for quieter operation and greater resistance to foreign objects and debris, rolling effortlessly on all types of flooring while preventing damage to the surface beneath. Effortless Assembly A patent pending "Slide-In" design mechanical structure that requires no more than one person to assemble. 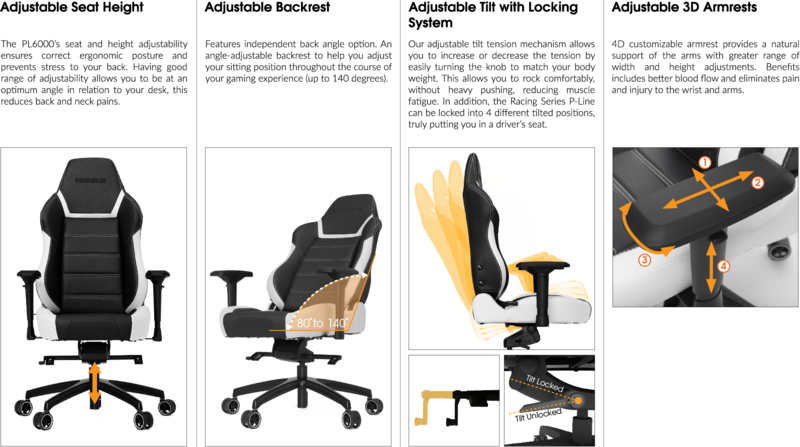 Extra Accessories: Cushions Additional Memory Foam Neck Support and Lumbar Support cushions are included. PUC While PVC and PU are frequently used in many faux-leather products, both experience tradeoffs between comfort and durability. With the introduction of PUC, we take the best attributes of both materials and combined them into one. PUC retains the strength of PVC while maintaining the delicate softness of PU leather, providing a low maintenance solution that is less prone to wear and tear, without ever sacrificing comfort. Adjustable Seat Height The PL6000’s seat and height adjustability ensures correct ergonomic posture and prevents stress to your back. Having good range of adjustability allows you to be at an optimum angle in relation to your desk, this reduces back and neck pains. Adjustable Backrest Features independent back angle option. An angle-adjustable backrest to help you adjust your sitting position throughout the course of your gaming experience (up to 140 degrees). Adjustable Tilt with Locking System Our adjustable tilt tension mechanism allows you to increase or decrease the tension by easily turning the knob to match your body weight. This allows you to rock comfortably, without heavy pushing, reducing muscle fatigue. In addition, the Racing Series P-Line can be locked into 4 different tilted positions, truly putting you in a driver’s seat. Adjustable 4D Armrests 4D customizable armrest provides a natural support of the arms with greater range of width and height adjustments. Benefits includes better blood flow and eliminates pain and injury to the wrist and arms. Made from premium quality PVC leather with stain resistant characteristics, the PL6000 has an extra dense foam padding that adds great support and comfort. The breathable open-cell structure limits heat being trapped. The PL6000’s heavy duty base frame is constructed with industrial strength metal to support up to 200 kg / 440 lbs of weight, for long lasting comfort. The PL6000 comes with 75mm/3” PENTA RS1 casters that are engineered for quieter operation and greater resistance to foreign objects and debris, rolling effortlessly on all types of flooring while preventing damage to the surface beneath. Additional Memory Foam Neck Support and Lumbar Support cushions are included. While PVC and PU are frequently used in many faux-leather products, both experience tradeoffs between comfort and durability. With the introduction of PUC, we take the best attributes of both materials and combined them into one. PUC retains the strength of PVC while maintaining the delicate softness of PU leather, providing a low maintenance solution that is less prone to wear and tear, without ever sacrificing comfort.